Hardly getting into the deep groove the title promises, organist Henry Cain’s The Funky Organ-ization Of Henry Cain instead is a carefully crafted soul jazz album produced by the legendary David Axelrod. Not only did engineer Rudy van Gelder shaped the sound of modern jazz, he also created the canvas for the gritty, groovy strokes of the organists in the sixties. Starting with Jimmy Smith in 1956, subsequently with a slew of others, Van Gelder succeeded to tame the overpowering Hammond B3 beast, bringing to the fore clear lines and a crisp and crunchy overall sound. As regards to small ensembles, it became the blueprint for other engineers and producers, provided they figured out how the wizard of Englewood Cliffs came to his surprising results. By all means, larger RVG-led productions weren’t less challenging. Jimmy Smith’s Verve LP The Cat, produced by Creed Taylor, engineered by Van Gelder, is but one example of Van Gelder’s flexible attitude towards larger bands that visited the famed studio in Englewood Cliffs, New Jersey. Henry Cain, a gospel-drenched bluesy player, would certainly have been a proper candidate for a Blue Note session in the early sixties. 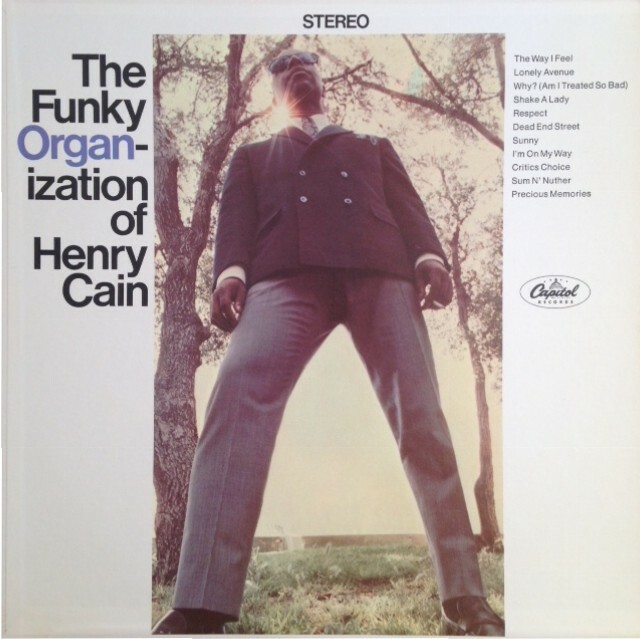 However, The Funky Organ-ization Of Henry Cain-session from 1967 is the organist’s only album as a leader in the sixties and beyond, up to his albums Cain’s Able and Something Another from the nineties. Cain, native of Indianapolis, Indiana (although there’s no recorded evidence, it seems likely that Cain has met fellow Indy citizen Wes Montgomery somewhere along the city’s illustrious strip of clubs, Indiana Avenue) performed with his trio The Three Souls for five decades. He moved to Los Angeles in the sixties, quickly turning into a seasoned accompanist. Cain performed and recorded with Della Reese, Bobby Bryant, Dinah Washington, Oliver Nelson and Howard Roberts. (Both Nelson and Roberts are featured on Cain’s album, the former providing arrangements, the latter guitar accompaniment) Cain is a notable, bop-bluesin’ contributor to pianist Jack Wilson’s outlandish album on Vault, The Jazz Organs. Henry Cain passed away in Las Vegas in 2005. The musical equivalent of an armored brick mansion that could use some fresh air but nevertheless fails to hide a series of charming ornaments, the densely orchestrated, richly detailed The Funky Organ-ization Of Henry Cain seems perfectly suited for the sun-tanned, happy-go-lucky Californian audience: the Axelrod treatment, markedly different than Van Gelder’s. Marked by expert musicianship, Axelrod benefited from hiring part of the Wrecking Crew, the legendary, loose-knitted group of studio musicians, many of which had a jazz background, that provided the background for countless hits and albums of the classic pop and soul era, including Sonny & Cher, Frank and Nancy Sinatra and The Beach Boys. The VIP’s of the Crew (or how the group was called initially, The Clique or First Call Gang) are drummer Earl Palmer, bassist Jimmy Bond, saxophonist Plas Johnson and guitarist Howard Roberts. Jimmy Bond’s plucky, cocksure bass (credited officially as James Bond, no gun intended…) is best likened to another L.A. studio legend, Carol Kaye. Soul (Otis Redding’s Respect), soul jazz (John Patton’s The Way I Feel, two tunes known from the Cannonball Adderley Quintet, Why? (Am I Treated So Bad)) and Nat Adderley Jr.’s I’m On My Way; not a coincidence, both tunes were featured on the quintet’s album Why? (Am I Treated So Bad), produced by Axelrod in March, 1967), r&b (Doc Pomus’ Lonely Avenue) and pop (Bobby Hebb’s Sunny) and a couple of original compositions: all tastes are catered for. But a hit wasn’t in the stars. So what, you can’t have it all, it’s 2017, fifty years after the fact, LSD is a long-forgotten pastime like the lost art of letter writing, thus why bother about the fact that Henry Cain didn’t score a hit? He did make an interesting album, so the best option might be to let the wicked winds of the world fly by your turntable and to settle down in your easiest chair, relax and put on a newly acquired copy of The Funky Organ-ization. Best option, no streaming equivalent yet. YouTube comes to the rescue, click above and below on the examples. The fast take of Sunny reveals careful preparation, from the hot interlude that signals a modulation to the slightly dissonant sax and trumpet voicings. While Precious Moments and the Oliver Nelson tune Critic’s Choice are pedestrian, Axelrod’s Dead End Street is a tacky tune with a good, probing groove. It includes crisp breaks, as does Ray Bryant’s Shake A Lady. Double time rhythm splices the soulful line of Cain’s Horror Scope in half. The Way I Feel is Cain’s natural habitat. The division between sections of ensemble, brass/reed and guitar/bass/drums by the other arranger of the album, H.B. Barnum, is very effective. All the while, Henry Cain’s fleet, churchy lines scream for attention. Because for all The Funky Organ-ization’s radio-friendly message to Muscle Beach, it’s evident that you may take the maid from the village but you can’t take the village from the maid.